While the weather down south is a bit warmer, we have had a few chilly mornings and evenings. So I know that fall is here. 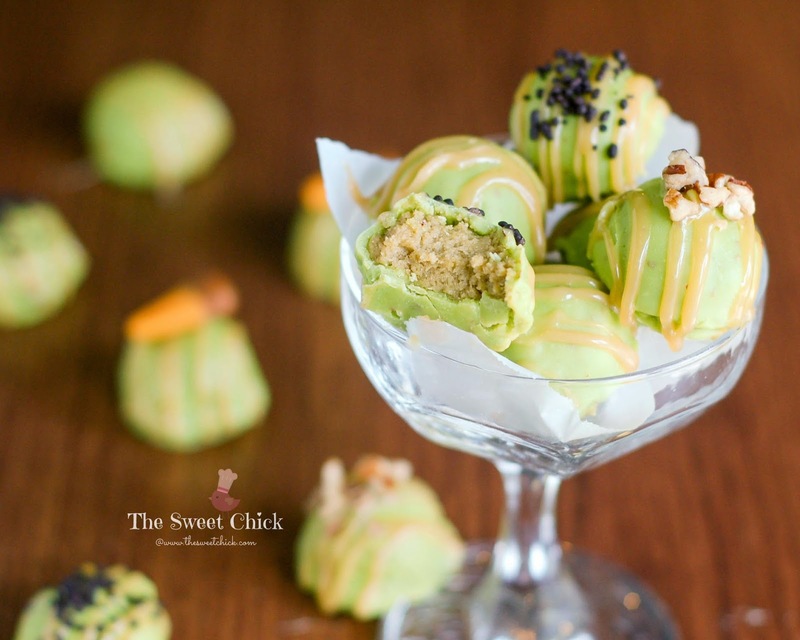 What better way to celebrate than with some Caramel Apple Oreo Truffles. 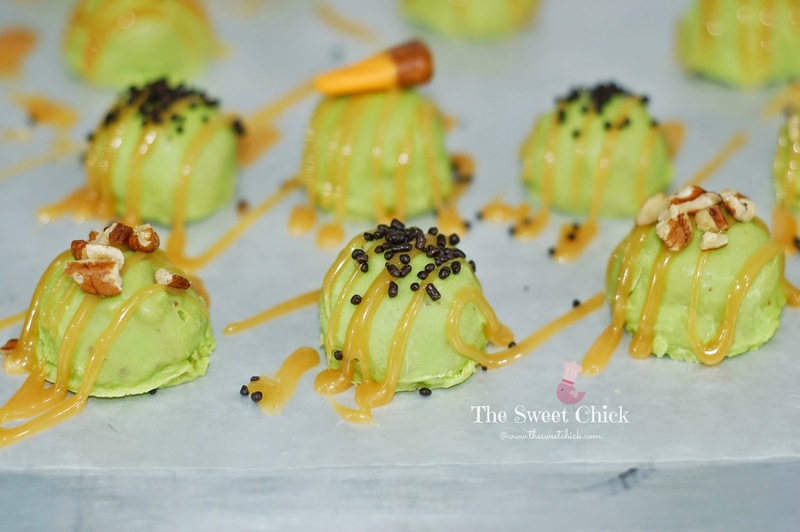 They have a crunchy outer layer of caramel apple candy coating, drizzled with caramel and inside is a soft, chewy filling made of Caramel Apple Oreos and cream cheese. A simple, no bake treat that you can bring to any fall party. I brought them to a neighborhood shrimp boil last weekend and they disappeared real fast. The kids and the adults loved them. The Oreos I found at Walmart and the Wilton's Candy Melts I found at Michael's. I mixed the crushed Oreos and cream cheese by hand, then used my mini scoop to make the balls. I just used a fork to dip the balls in candy melt. For toppings I mixed some caramel into some vanilla candy coating and drizzled it on top. Then I sprinkled the truffles with either chopped pecans, chocolate sprinkles, or Caramel Candy Corn. The caramel drizzle did stay a bit tacky, but it gives the truffles a bit more caramel flavor. Overall they do taste like caramel apples. They are on the sweet side, but I made the balls bite-sized so you don't get overwhelmed. Like I said, these are great party treats. My neighbors big and small really enjoyed them. I hope you do too. Crush Oreo cookies in a food processor until they are a dirt like consistency. In a medium bowl, mix the crushed Oreos and cream cheese until completely combined. With a mini scoop, measure out 26 mounds and place them on a wax paper lined air-tight container. Place the container in the freezer for at least 1 hour to set. After the balls are set, melt candy coating in the microwave as per directions on package. I did half the bag at a time. 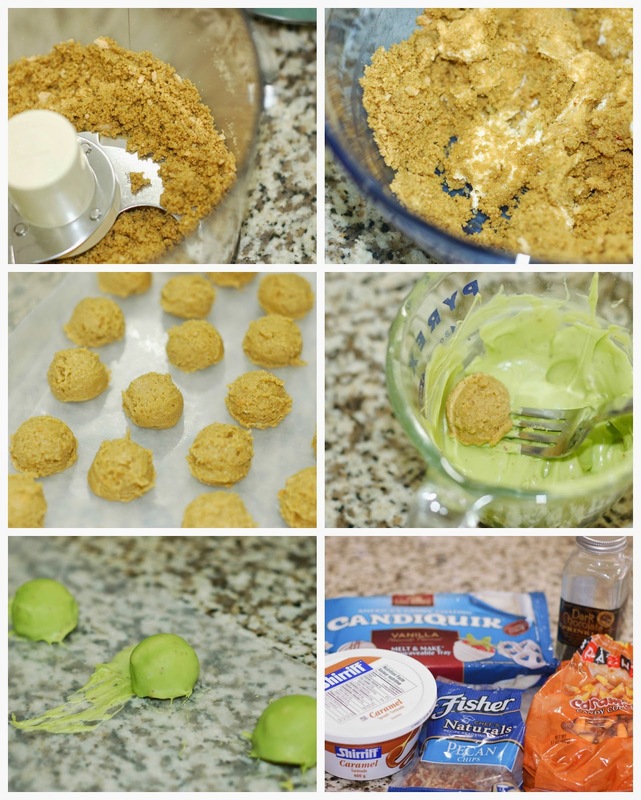 Remove Oreo balls from the freezer. Do a small batch at a time so they don't fall apart. If you need to, just place them back in the freezer for a few minutes. Feel free to reshape any balls that are not to your liking by rolling them around in your hand. Just do it quickly not to warm up the dough too much. 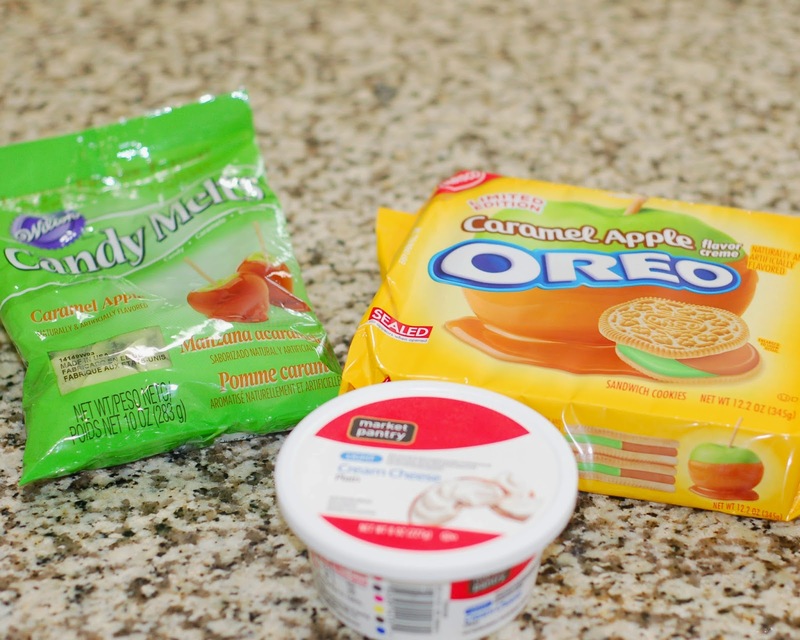 Combine the melted candy coating and the caramel, mix well. Then place in a candy decorating bag or Ziplock bag with tip cut off and drizzle over the tops of the truffles. 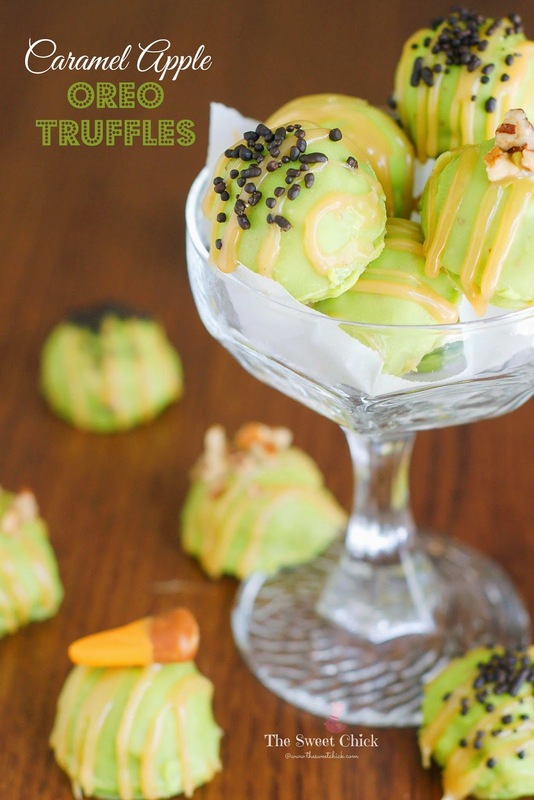 If you are adding sprinkles, nuts, or Candy Corn, add them to the top of the truffles before the caramel drizzle sets. The caramel will not completely harden, but will become firmer. These truffles can be made ahead of time and refrigerated for 3-4 days. Perfect truffles! 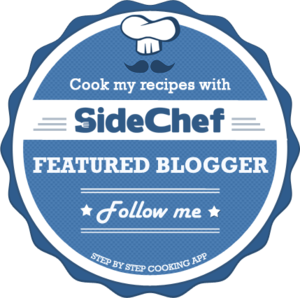 I could eat it right now! Thanks Ilona, Wish I could ship them out, but they are all gone.